The Lorenz Adlon (one-star Michelin, 17 GaultMillau points, and five cutlery), in Berlin, Germany provides a romantic setting that complements Chef Thomas Neeser's French haute cuisine. The Lorenz Adlon restaurant located in the Hotel Adlon Kempinski knows how to set the stage for a perfect evening, beginning with a warm welcome from Mr. Gerhard Retter, selected as Maitre d'hôtel of the year by Schlemmer Atlas. As Mr. Retter waltzed Edward F. Nesta and I to our table, I had a glance of the moonlit Brandenburg Gate, and I knew then that this was indeed going to be a very special evening. 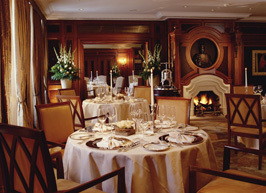 The ambience at the Lorenz Adlon is sumptuously gorgeous with two dining rooms; the first room is round, where a fire blazed invitingly in the fireplace the night of our dinner in March 2007. The other room is a charming library with rich wood paneling, and book lined bookshelves along three walls. We had dinner in the library where my eyes were torn from gazing at the remarkable view of the renowned landmark, the spectacular hand-painted ceiling, and my date, although I tried to gaze discretely, to give proper appreciation to all of the aforementioned. Our table was draped with creamy, butter yellow linens and accessorized with napkins arranged in silver napkin rings. Silver charger plates, knives set on knife rests, sparkling crystal, tall white tapers burning in ornate silver candlesticks, an oval vase held four red roses, and a whimsical peacock sculpture made of spoons, forks, and other kitchen tools, made by the Alsatian sculptor Gérard Bouvier, completed the stunning table setting. Floor to ceiling taupe silk fabric framed the windows, there was a beige and gold carpet with a leaf motif, gold faux-suede fabric covered the chairs, sconces added a soft glow to the room, and vases held long stem ripe red roses in a corner of the room. At Sommelier Arno Stegoweit's suggestion, we began our romantic evening with an aperitif of 1998 Dom Perignon Champagne, with a pale yellow color and aromas of toast and berries, with a full creaminess on the palate with crisp mineral notes. The champagne was the perfect accompaniment for the delectable Amuse Bouche of a skate wing with a potato crisp with salad poking through, and a tiny new potato delicately crisped and topped with caviar and Cipriani dressing. I really loved how the tastes and textures melded and contrasted in this tiny tease. A Greeting from Chef Thomas Neeser followed the Amuse Bouche in the form of a colorful presentation of filet of halibut intricately wrapped in a scallion and presented on a bed of spicy papaya chutney that was a perfect foil to the pool of light saffron foam. For Edward's first course, he had Composition of foie gras with black walnuts and pear, which Sommelier Stegoweit paired with a 2001 Wenzel Am Fusse des Berges Ruster Ausbruch, a lovely dessert wine made from a blend of Sauvignon Blanc, Welschriesling, and Pinot Grigio, with honeysuckle, apricot, and melon on the nose and on the palate. Edward loves foie gras and he really enjoyed this interesting presentation of a square of three layers of foie gras jelly, grilled foie gras, and a deep-fried ball with foie gras inside. I began with a first course of Dialogue of sturgeon and red beets with Imperial caviar paired a 2003 Hans Lang Riesling, Rheingau Selection. This course was artistically presented as a bed of rectangular beet jelly, topped with a rectangular piece of sturgeon, with a thin filet of sturgeon rolled into a "cannelloni" filled with sturgeon mousse, topped with a soldier-straight line of caviar with two chive garnishes, and tiny beet "teardrops" on the plate along both sides of the sturgeon. Happily, this stunning presentation was every bit as tasty as it looked. Edward continued with Pan seared Norway lobster with citrus marmalade and sautéed romaine lettuce paired with a 2005 Hubert Lamy Puligny-Montrachet "Les Tremblots" made with 100% chardonnay grapes with mineral notes and green apple on the nose, with a crisp, green apple finish. For my second course, I had the Epicurean lobster on a braised fig with hemp-mocha-chocolate sauce deliciously paired with a 2003 Hans Lang Riesling Erstes Gewachs (Grand Cru) Hattenheim Wisselbrunnen, a delicate pale gold with an aromatic nose and lots of rich fruit on the palate. This course was a succulent lobster claw with lobster meat on a richly intense sauce, and paired with the braised fig, it was heavenly. For Edward's third course, he had Organic fed beef tenderloin with salsify, Savoy cabbage, and sauce Périgordine paired with a 2004 La Spinetta Ca' Di Pian Barbera d' Asti, a gorgeous wine made with 100% Barbera with cherries on the nose and rich cherries and deep plums on the palate. I continued with Parsley coated filet of "turbot du corde" with potato mousseline and a decadent layer of perigord truffles paired with a 2001 Chateau Beaucastel Chateauneuf-de-Pape, Vieilles Vignes, with a delectable, aromatic nose of black fruit and pepper, with rich ripe fruit on the palate and a powerfully long velvety finish. Maitre Antony can select from 150 cheeses to stock his cheese trolley, and the night of our dinner he had a heady mix of 25 cheeses including alpine cheeses, Vacherin Mont d'Or, goat cheeses, Roquefort, Morbier with a layer of ash, and many others which tempted our palates. We carefully made our selections, which were accompanied with celery, raisins, walnuts, black cherry marmalade and a spicy green fig salsa. Paired with a 2005 Alsace HVH Gewurztraminer Tradition Hugel, as cheese devotees we could have been content sampling cheeses all evening. For his dessert course, Edward had a delicate Passion fruit soufflé, with exotic fruit salad and coconut ice cream expertly paired with a 2006 La Spinetta Vigneto Biancospino Moscato d'Asti. I ended the evening on a decadent note with a richly flavorful Composition of Valrhona Araquani chocolate and Thai Pattaya mango paired with a 1927 Alvear Solera Pedro Ximénez Montilla-Moriles that was so excellent, that I shared a sip or two with Edward, although I must admit that I kept the chocolate for myself. Beautifully presented with chocolate initials painted on the plate, this course consisted of a quenelle of mango sorbet bursting with fresh fruit flavor, and a miniature warm chocolate cake that melted on the plate when I dipped my fork into it, which was pure chocolate indulgence. Chocolate cream was piped into a thin chocolate cylinder speckled with gold leaf on a bed of tiny, diced mango, thin filo pastry was filled with chocolate paste and dusted with confectionary sugar, and a mound of chocolate ice cream resting on a freeform chocolate leaf brushed with gold leaf completed this chocolate fantasy. Chocolate petit fours presented on a tiered silver stand were the grand finale to a wonderfully romantic dinner at the Lorenz Adlon. Read other articles on the Lorenz Adlon and the Hotel Adlon Kempinski in the Hotels and Resorts, Spas, and Chefs' Recipes sections where Executive Chef Fabrice Lasnon and Chef Thomas Neeser share recipes in English and in German.